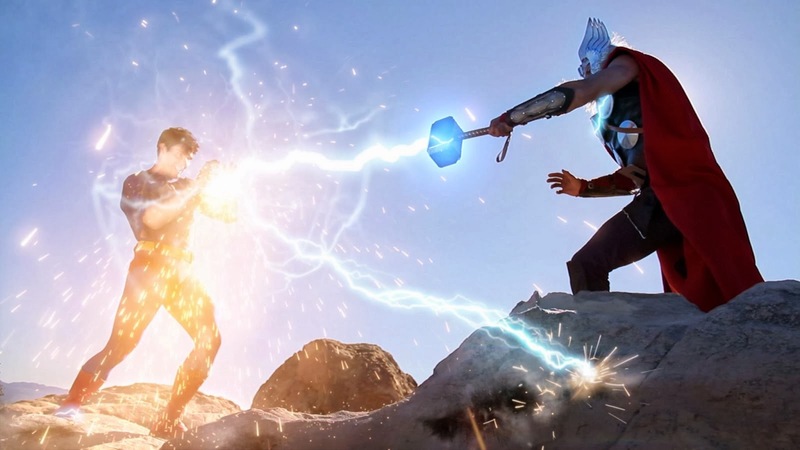 Okay, so the first strike in JLA/Avengers had Thor knock Superman's jaw for six with his hammer, spurring both teams into conflict, but how would a brawl for it all between The Man of Steel and The God of Thunder really shake out? Seems the crew at Super Power Beat Down have a pretty fair idea. They've created this awesome special FX filled short film of the two Hollywood heavyweights, duking it out in the wild. Place your bets and hit play, the winner might just surprise you. While for my money Thor has no counter for Superman's speed, S.P.B.D. do a great job making the match seem even. Colin Bryant has some difficult lines to blow believability into as Thor, but he really hits them with all the force of an enchanted hammer. Standing opposite his efforts, Josh Boultinghouse really embodies Kal-El on camera. One of the best I've seen - he actually can act the role with the bulk to pull it off - and that's a rare combination! Expanding on his performance from fellow fan-film, Superman: The Golden Child, Josh's Superman makes him a great dark horse contender for the big-screen role, you know if Cavill ever gets tired of money and fame. They did a really good job with their special effects. And I think Thor might have a future in the Terminator franchise. Actually my fav quote from T2 is "There are 206 bones in the human body. That's one." So maybe if I think of that being said by Supes it'll even things out. Look - problem sorted! How easy was that? !